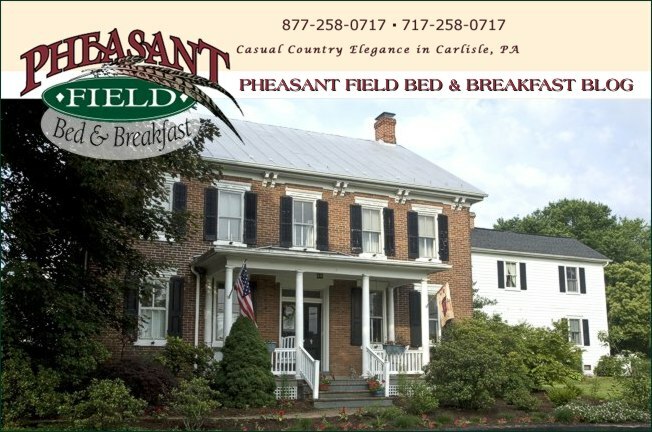 We are hosting a group of spinners and knitters here are Pheasant Field Bed & Breakfast. The spinning instructor is Beth Smith from The Spinning Loft in Howell, MI. The students spin in the mornings and knit in the afternoons. The knitting instructor is Anne Hanson, who is teaching the participants how the knit lace. Check out Anne's site at KnitSpot. Some of the students have used their spare time to hike the Appalachian Trail with their canine friends who came along for the class. They have enjoyed some of Carlisle's wonderful restaurants such as Cafe Bruges and Marcello's. Be sure to see our FaceBook post from Thursday for more pictures of this Spinning & Knitting Retreat.